Reaching this influential crowd requires a thoughtful and customized approach. In a market that is bright and continues to flourish—the food industry—corporate chefs have become an increasingly influential audience for marketers to reach. The chef is a culinary professional bringing a unique mix of skills to the table. He or she must balance a variety of forces from the artistic to the scientific. On one side, consumers are often driving leading edge taste trends, while on the other suppliers compete for chefs’ attention in a marketplace fraught with challenges. Before you can effectively target this audience, you must first gain a deeper understanding into their complex roles, needs and preferences. This whitepaper gives insights into the corporate chef's daily challenges, how they keep up to date with consumer trends and provides a strategy for connecting with this audience. 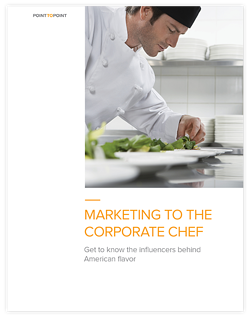 Download this paper and learn how to connect with the corporate chef.